The most common small arms weapon carried by the Federals were rifle-muskets that used 0.69-caliber ball ammunition and a version of the newly adopted Springfield rifle-musket, Model 1855 or possibly 1861 that fired the 0.58-caliber Minie ball. The 1st Illinois Cavalry were armed only with sabers and single shot pistols. For artillery, the Federal defenders had nine artillery pieces. 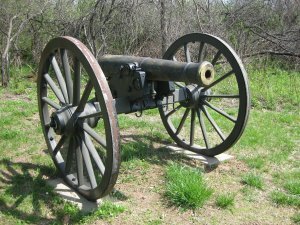 Seven of these were the same smooth bore, Model 1841 6-pounder Guns used by the Missouri State Guard. There were two gun batteries, one in the Lafayette County Home Guard and one manned by U.S. Reserve Corps Infantry Battalion. Two mortars were also in use, manned by the Lafayette County Home Guard, most likely Model 24-pounder Coehorn Mortars. The Missouri State Guard used a wide variety of small arms, including conversion muskets, hunting rifles, carbines, and shotguns, that greatly complicated the logistics of keeping the troops supplied with ammunition. They were using a significant number of the 0.58-caliber Springfield rifle-musket, Model 1855 or possibly 1861, that had been captured from the Federals during the Battle of Wilson's Creek. For artillery, the Missouri State Guard had five batteries, totaling 16 artillery guns. They used the smooth bore, Model 1841 6-pounder Guns. Bledsoe's Battery also deployed "Old Sacramento," a gun captured during the Mexican War that had been adapted to fire a 12-pound projectile. While guns were intended to batter down the walls of a fortification, mortars were designed to fire explosive shells in a high arc over the walls of fortifications. The barrels of the mortars were short and they only required a small powder charge. Coehorn mortars were lighter mortars, designed to be carried about by four men. Coehorn mortars were classified as a siege and garrison weapon. It took five men to operate a mortar.